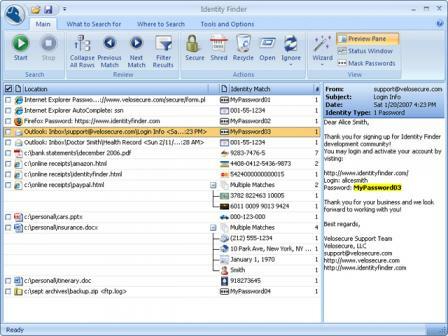 Identity Finder Home Edition is an incredibly useful and handy application that gives you the opportunity to find out by scanning you entire system for any personally identifiable information and the giving you the option to wither securely delete or encrypt the data it comes across. It uses proprietary search algorithms to identify and uncover a variety of different types of personal information and by deleting or securing the information it comes across, you can rest easy knowing that you’re a lot safer when it comes to the threat of identity theft. - Uses proprietary search algorithms to uncover and inform you of various types of specific personal and private information (social security numbers, bank account information, etc.). - Discovers your identity matches automatically and without requiring you to add any information whatsoever. - Gives you the ability to add unique personal information (dates of birth, driver’s license numbers, etc.) for the program to find. - Finds what you need to protect regardless of where it’s hiding (web browser hidden storage areas, auto complete fields, etc.). - A series of wizards to help guide you through the process. - Lets you choose whether you’d like to encrypt the personal information it recovers or securely delete it forever. - At least 50 MB free hard disk space. Automate all your day-to-day tasks.